The battle for the second Milan spot is in full swing. After a series of upsets for the R6 Pro League’s EU division in matchday 11, teams looked to recover and stand their ground in matchday 12. Team Empire meeting with G2 Esports was the most anticipated match of the day, while Na’Vi attempted to dig themselves out of a rather deep hole in the standings. As Michael “KiXSTAR” Stockley noted during the LATAM broadcast, the community votes have shifted toward a team pride mode of voting, rather than an actual analysis of which team could win a match. 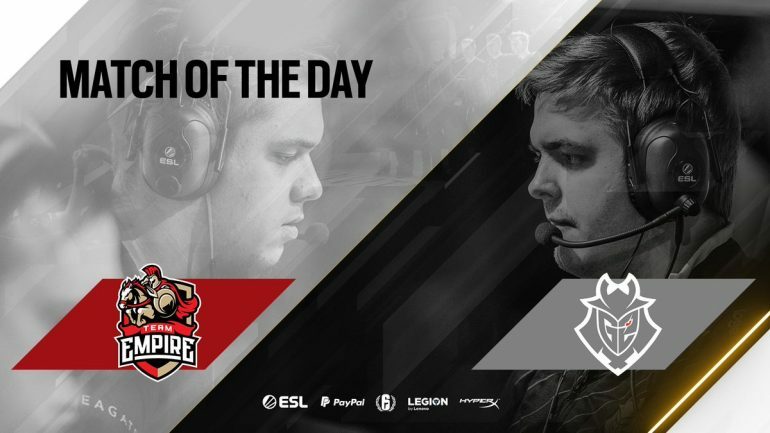 Team Empire and G2 Esports kicked off the day on Border. With Empire already having a secure spot in the finals and G2’s relaxed outlook on not going to Milan, the stakes weren’t particularly high for this match. Artur “ShepparD” Ipatov popped off in the first round with a 4K against G2. ShepparD slammed three G2 players through the same wall with the same angle. Empire took an early lead of 3-1 in the match. Both teams looked to be playing a looser game than usual. With a lot of rotations, strat changes, and gunfights taken, Empire and G2 gave fans a show of experimentation. Artyom “Shock” Simakov missed out on two easy kills on unaware G2 defenders, but honestly, it was fitting with the tone of the match thus far. Fabian Hӓllsten locked up a first attack round win for G2. Jevgeni “karzheka” Petrisin got a bit too relaxed, which allowed Fabian’s aggressive Buck plays to secure and plant Armory. G2 continued to build momentum from there on out. G2 eventually brought the match to an entertaining 6-6 draw. While draws have been disappointing in the past couple weeks of play, this one was particularly entertaining to watch. The match gave us frag-heavy performances across the board, with Fabian being a standout yet again. Ultimately, the match doesn’t mean much. Empire was already assured a spot in the finals no matter the outcome. CHAOS and LeStream Esport fought on Coastline. This match had significantly more importance than the first of the day. LSE needed to fend off CHAOS in order to secure their spot in the finals. Nomad, Dokkaebi, Echo, and Valkyrie were banned out of match. Round one saw LSE’s Théophile “Hicks” Dupont slip up and allow CHAOS an early round win. Mattias “Renuilz” Nordebäck clutched the one-vs-one to secure the defuse, and all with Maestro’s Bailiff equipped. CHAOS ran a perfect round two defense that tripped up LSE in a big way. Renuilz continued with his momentum and CHAOS fed into it perfectly. Rickard “Secretly” Olofsson even got the final kill with Clash’s shock charges, which was a sight to behold. Christoffer “Kripps” Brushane gave CHAOS their fourth round win in the form of a massive 4K against the unexpecting LSE. KiXSTAR and Robert Flynn both pointed out how absurd Kripps’ peeks were throughout the match. It took six rounds for LSE to secure a win and even then the win relied on LSE removing Clash from the board early in the round. Aleksi “UUNO” Työppönen secured the final two kills in round seven to grab LSE another round win. Unfortunately, LSE fell apart in chaotic fashion and threw away the match at 7-2. CHAOS now has the tie advantage over LSE if CHAOS continues their streak through the final matchdays, according to Flynn. If you weren’t able to watch the match live, it is a must watch. Fans can catch it on the official R6 Pro League YouTube. Na’Vi looked to climb back out of the bottom spot with a win over mousesports on Villa. The bottom-ranked Na’Vi desperately needed a win here to help put Team Secret back in the hot seat, while mouz looked reverse their downward spiral. Teams opted to ban out Glaz, Maverick, Mira, and Echo. Niklas “Willkey” Ojalainen’s Clash managed to delay Na’Vi’s attack in the last seconds, but only after Ville ”SHA77E” Palola cleaned up Na’Vi as Maestro. Pascal “cyrn” Alouane pretty much gave up in a one-vs-five situation and opted to hang outside for the last 45 seconds of round two. Flynn speculated that maybe cyrn was waiting for his team to give direction. Surprisingly enough, Na’Vi managed a perfect attack for a round three win, but couldn’t keep it up in round four. Santino “Gomfi” De Meulenaere came alive to clutch the one-vs-one in round five by threading the needle through a lone bullet hole to bring the match 4-1. Gomfi continued to maintain control in round seven to ensure mouz a point at 6-1. Na’Vi won their first defense with a flurry of nitro plays to bring the match 6-2, still in mouz’s favor. Mouz dropped a five-vs-three man advantage in round nine, but came back the next round for the match win. Willkey’s Clash and Montagne proved useful, while Gomfi came back from a slump in a total frag show to force the win. Lastly, Team Secret fought it out with PENTA Sports on Coastline. Secret needed to secure this match in order to further distance themselves from auto-relegation. Na’Vi dropping their match helped Secret’s outlook heading into the match. Ying, Glaz, Pulse, and Smoke were all locked out of play. Early matches saw uneventful back-and-forths that signaled a cautious play style by both teams. PENTA managed to slowly build momentum to get themselves an early lead of 3-1. KiXSTAR pointed out that Secret could have adjusted to punish PENTA’s slow pace, but failed to do so, which is why they trailed heading into the half. Balazs “Blas” Kovari and Lucas “Hungry” Reich smashed through Secret defenders in round five for a lead of 4-1. Round six saw some poor player placement on Secret’s end by giving PENTA free kills in the early seconds. Hungry and Blas continued to dominate through round seven to bring the match 6-1. PENTA held momentum through the match to sweep 7-1. There was a lot riding on this match for Secret and they seemed to just throw the match away. With little to no aggression from Secret, PENTA was allowed to gain early control of sites and just clean up players attempting to retake. Na’Vi and Secret go head to head next week. Even the winning team of that matchup will still have to play relegation matches. At the end of the day, CHAOS upset the balance with another win, and mousesports wiped out Na’Vi pretty easily. It will be an interesting week next week when we finally see who will end up in auto-relegation. Hopefully, everyone brings a shield—they’ll need it. Pro League returns Monday, April 15 with the NA division broadcast. The EU division picks back up Friday, April 18. As always fans can catch the official broadcast here.